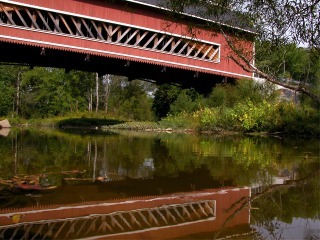 click photo to enlarge The first three bridges pictured are in Ashtabula County in northeast Ohio. The last two are in southeast Ohio in Washington County. 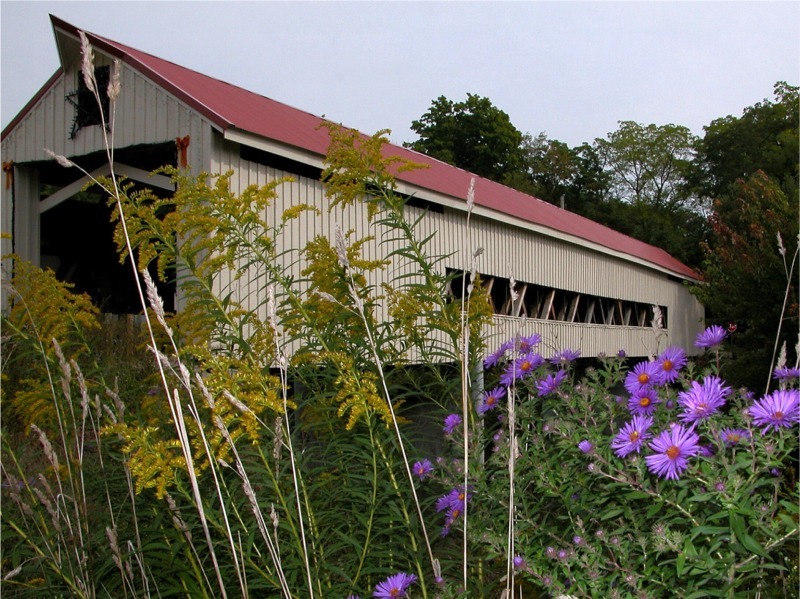 In October when the leaves have turned colors, Ashtabula county has a Covered Bridge Festival. We never went to the actual festival but would go the week before or after. 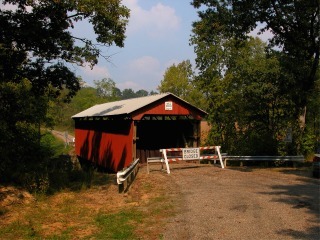 They provide nice maps of all the covered bridges in the area, and there are signs directing you to each bridge. The map also includes a little history on each bridge. 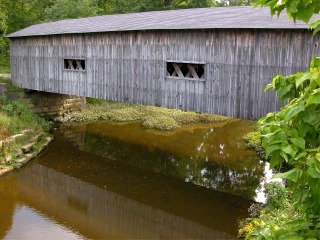 This is the Netcher Road Bridge over Mill Creek. This is actually a new bridge, started in 1998.
click photo to enlarge This is the South Denmark Road Bridge. It was built in 1890. It spans Mill Creek. From information I have been able to find, bridges were covered to help keep them from spooking horses when they would cross them. It was also done to protect the wood decking of the road surfaces. click photo to enlarge This is the Mecahnicsville Road Bridge. This bridge is the longest single span bridge in Ashtabula County and was built in 1867. It was renovated in 2003 - 2004. Every bridge has a sign on it with the name of the bridge, the architect/engineer, its length, the type of design, the built, etc. The tour of bridges in Ashtabula County covers 16 bridges. Most of them still handle daily traffic. click photo to enlarge This bridge and the last one are in Washington County in southeast Ohio. These bridges were not easy to find, although they all seemed to have a fairly recent coat of paint. The brochure we got from the visitors center in Marietta did not even have a map. We were lucky, and got a map at a museum, but it was printed in 1972, and a few, no longer existed. We found only one that still carried traffic. We parked here, along the road, and enjoyed lunch in a lovely tranquil setting, although an acorn almost hit Karen in the head. Instead, it hit her plate with a loud bang. 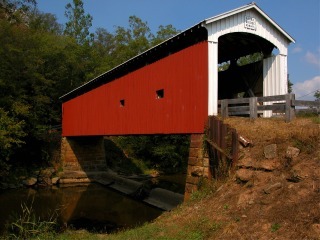 This bridge is Bell Road Bridge built in 1888.
click photo to enlarge This is the Harra Covered Bridge, built in 1876. It spans 101 feet across Wolf Creek and is beside the Harra farm. It no longer carries traffic. Washington County has a Fall Foliage tour and the web site says there will be signs for the bridges. We saw very few signs when we were there in mid-September. 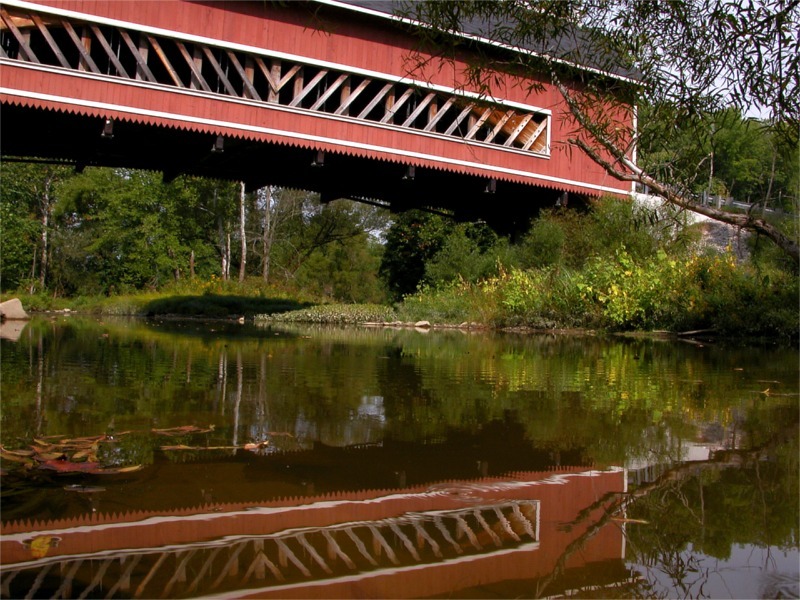 Unlike Ashtabula County, which encourages visitors to enjoy their bridges, we found the Washington County bridges difficult to find. We went into the local AAA office, the Chamber of Commerce and the Marietta Visitors Center, and the information each of them provided was either minimal or nothing at all. Visiting the Washington County covered bridges is well-worth the effort, but make sure you have a detailed County map that also shows un-paved county and township roads. We thoroughly enjoyed touring the bridges in both counties, and imagining what it was like in the1800s to hear the clippity-clop of horses' hooves on the wooden bridge decking.